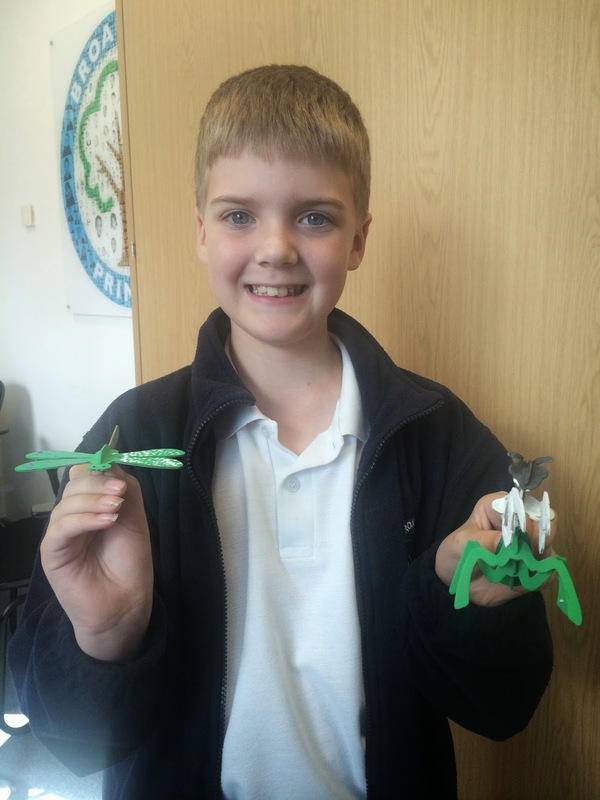 Riley has been busy finding out about facts to do with insects... and constructing models of them. Did you know that Mantids can turn their heads 180 degrees to scan their surroundings? With two large compound eyes and three other simple eyes located between them they are well equipped to watch out for both prey and predators! Pupils in Year 5&6 had great fun exploring the technique of finger painting - which is used to great effect by Aboriginal tribes in Australia. 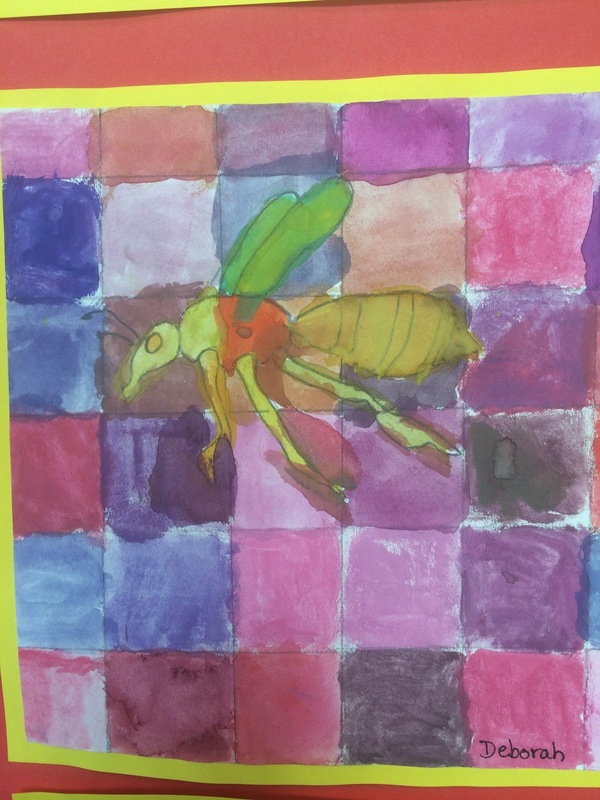 With just simple blends of colour and dots they created some stunning images. Hippopotamuses are found in Africa. 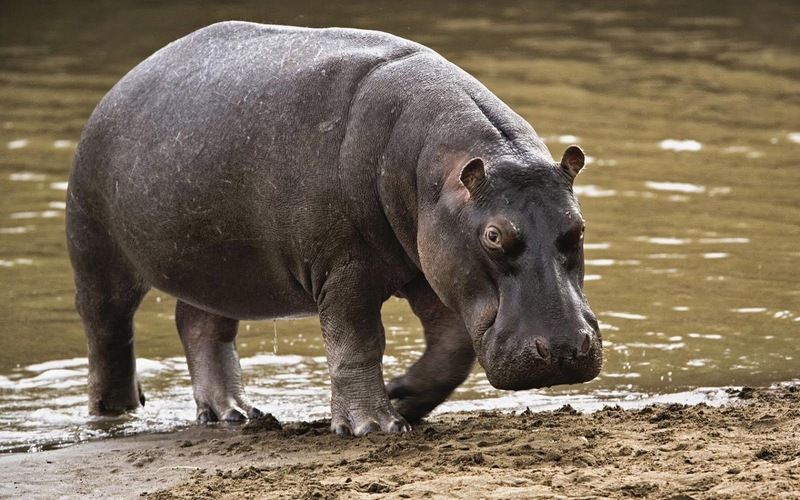 Were you aware that the name hippopotamus means ‘river horse’ and is often shortened to hippo? Star Award: Samson collects his trophy! Isaac Wright has collected his golden bookmark. Sam Murcia & Holly Maskell have managed to finish their Platinum trackers and move onto Diamond! Samson Wright has earned his Star Award and will soon have reached the end of his journey! 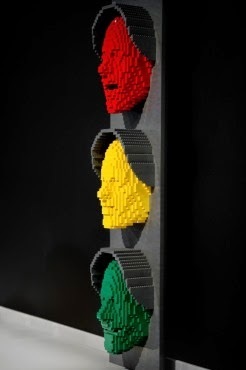 Art of the Brick - Look Where We're Going! 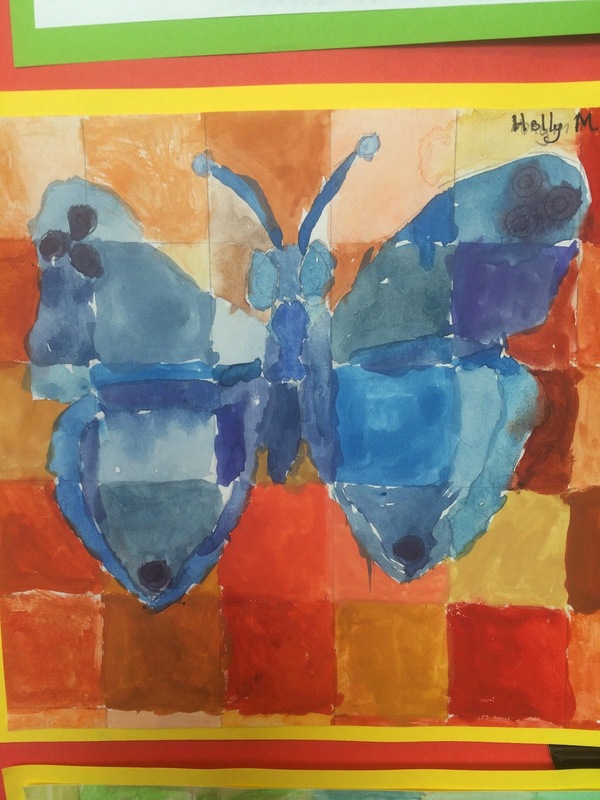 This year Mrs Caccavale is leading an exciting project to promote art and design within the school. 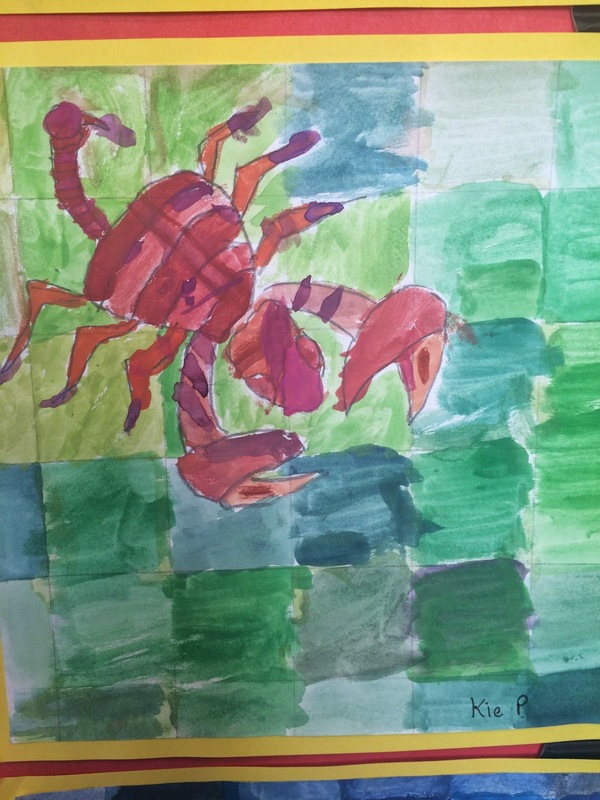 At the moment the children are working on a project connected to environmental art. In the second half of this term they will begin to look at 3-D modelling. What better inspiration than Lego? It's quite likely that you spent hours playing with Lego as a child. It's also possible that you are about to wish you'd kept going. 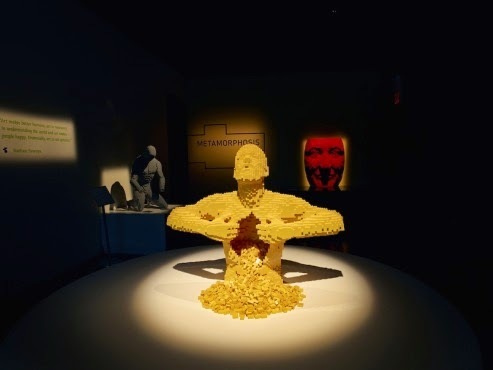 Former corporate lawyer turned master of tiny bricks, Nathan Sawaya never stopped. His touring show 'The Art of the Brick' has visited Asia, America and Australia and is now making its way to Brick Lane (where else?) for its UK debut at the Old Truman Brewery. Collectively the artworks, which are all made of Lego, took a painstaking 4,188 hours to build. 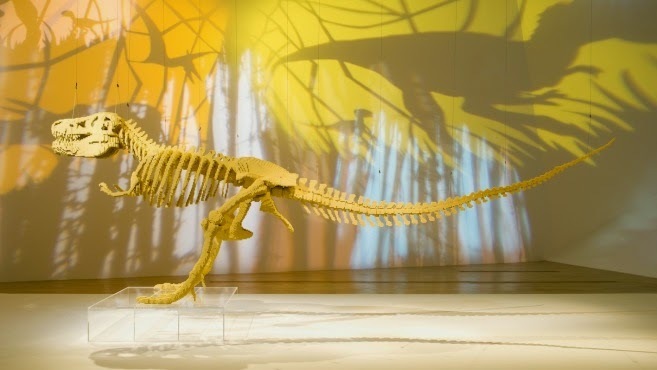 Sawaya's colourful large-scale sculptures include recreations of famous artworks such as Da Vinci's Mona Lisa and the Venus de Milo as well as many original pieces including a six-metre long T-Rex skeleton constructed from over 80,000 bricks. It would be a bit cruel to expect children (and most adults) to explore without the promise of getting hands-on at some point so, after gathering inspiration from Sawaya's creations, visitors can head to the Interactive Zone to build their own mini masterpieces. Our children will be going to visit the exhibit as part of their project. We can't wait to see their creations! 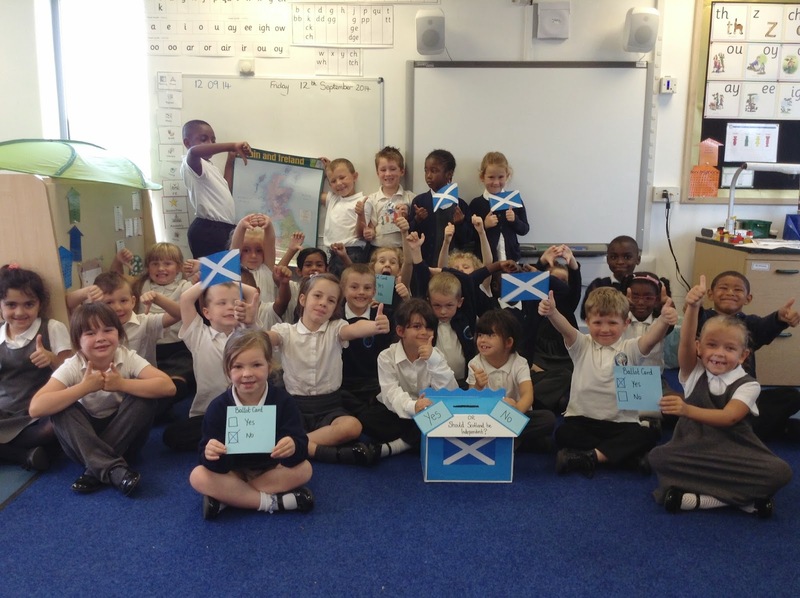 This week pupils at Broadford Primary School have been looking closely at the Scottish Independence referendum as part of the topic about the United Kingdom. 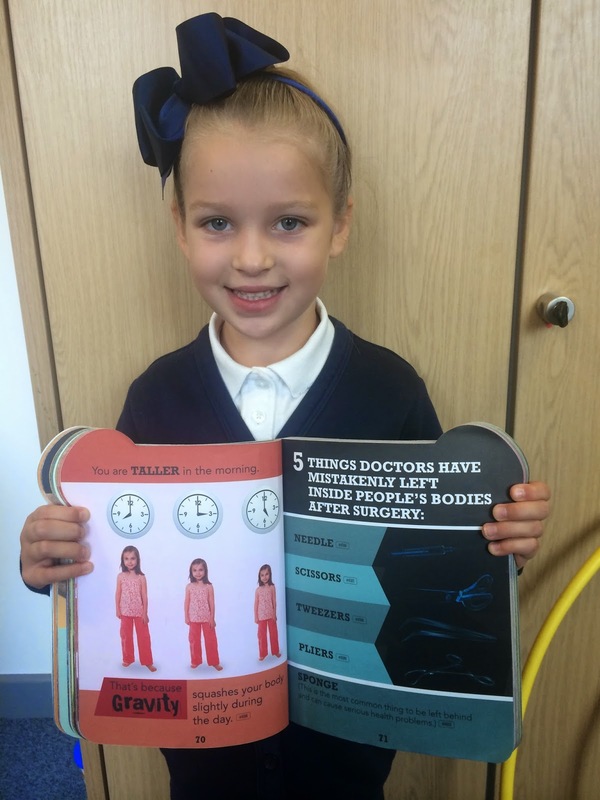 In order to get a better understanding of all the issues, the Year 2 pupils have been watching Newsround, listening to the news and reading their pupil newspaper. It has led to lots of interesting thoughts and questions. 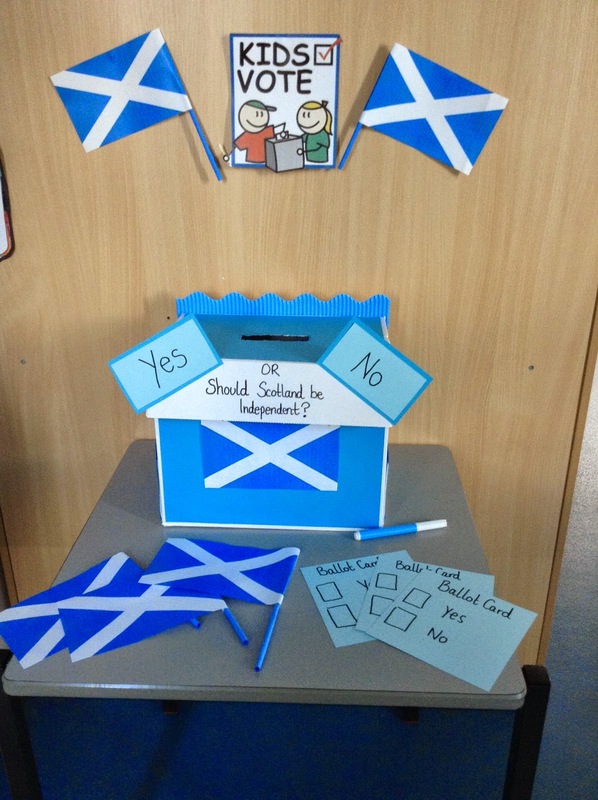 Having thought about lots of different reasons for and against Scottish independence the pupils organised their own ballot to see what the opinion of Cedar class was. 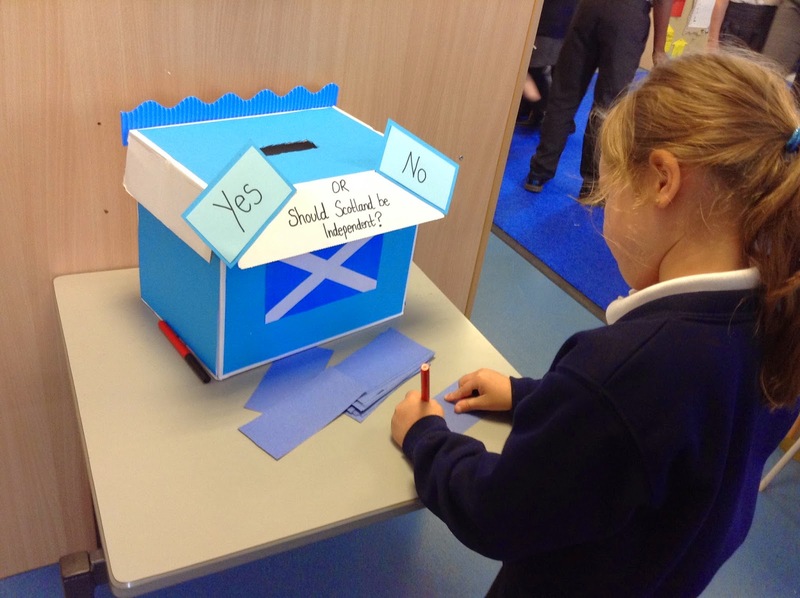 A ballot box was created and children voted Yes or No as a finale to the debates. Results by Friday afternoon were 66% of Cedar Class said No it should stay within the UK with the remaining 34% agreeing it should be its own country. Following on from their first Geography lessons, where they secured knowledge their knowledge of the countries of the UK, their capital cities and famous landmarks this was a great, topical way to explore the challenges of living in a Kingdom made from many different parts. 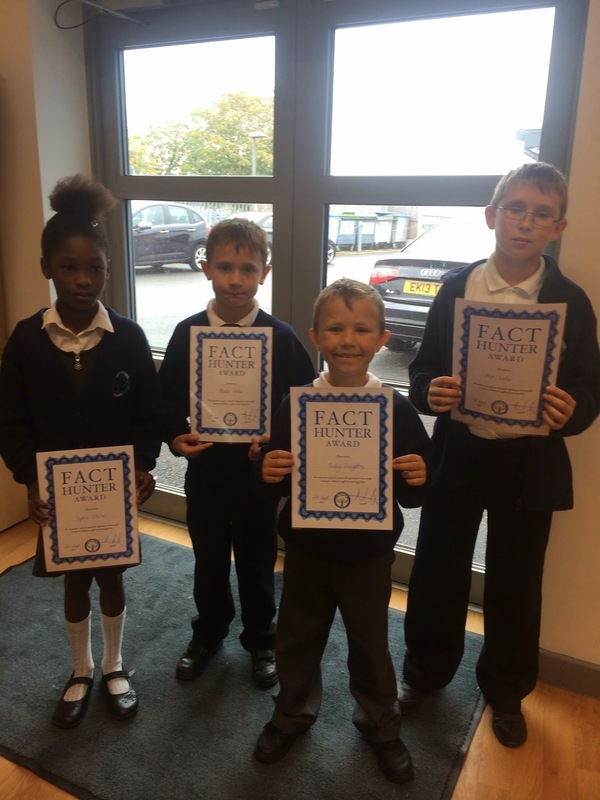 "It has been great to hear our pupils - who are only aged 6 & 7 - discussing some quite complicated issues with real insight. I hadn't thought about losing Andy Murray as a national asset. Who would we have to win Wimbledon if Scotland became independent? 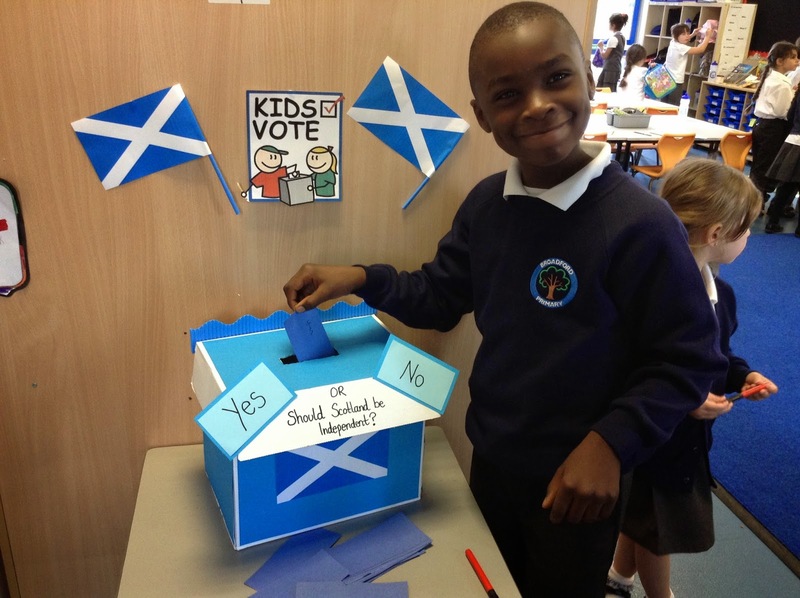 Although it is a question for the Scottish, the excitement that the ballot box caused and the passion of the debate showed that our Harold Hill children care very much indeed about the future of our country." Mrs Gemma Foulser - class teacher. 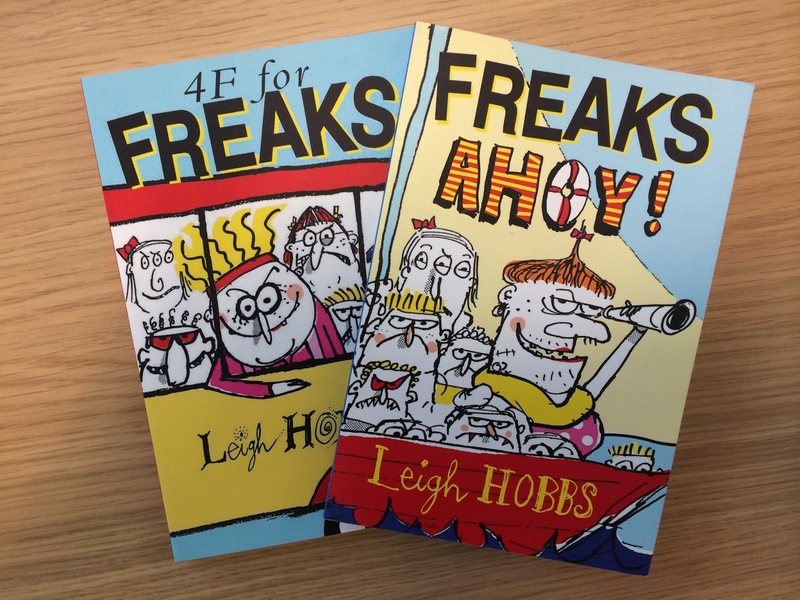 On October 14th we have Leigh Hobbs - author and illustrator - coming to visit the children. He will be holding workshops where the children will get to see how he draws his characters and hear how he comes up with his stories. 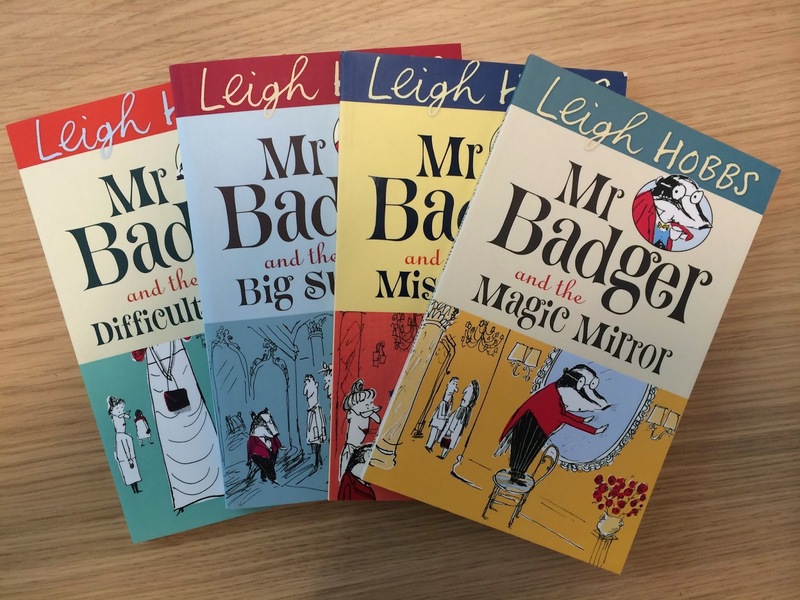 Miss Sparkes has made sure that we have added several of Leigh's books to the library so that the children can read them before he arrives. Some of the funniest tales are based on a class of unruly children - 4F! 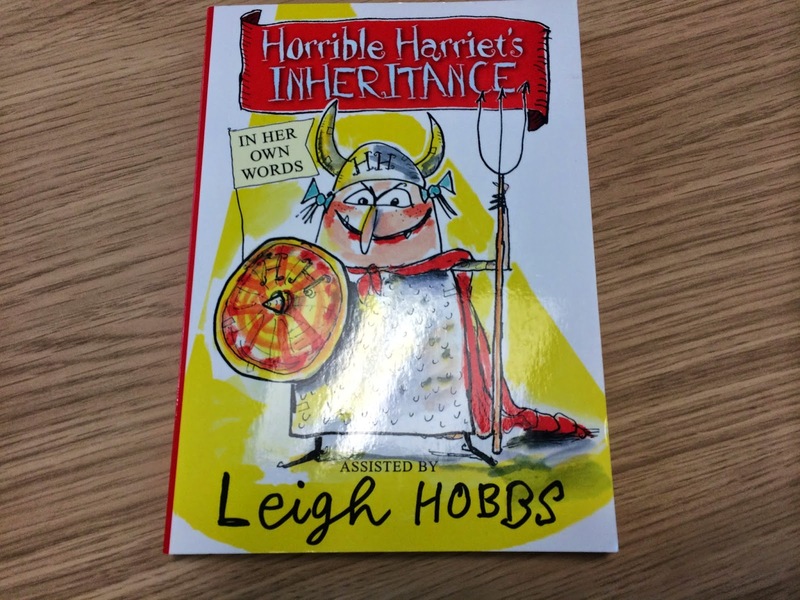 This year we have several writers visiting: Leigh Hobbs, Anne Fine & Louise Yates are already booked in. These visits should inspire the children to try writing their own short stories and encourage them to visit Miss Sparkes to borrow the books from the library. Shockingly, 772 incidents of foreign objects left in patients between 2005 and 2012 have been reported! Equipment like sponges, towels, needles, instruments, retractors and other small items and fragments of tools have been found in patients. 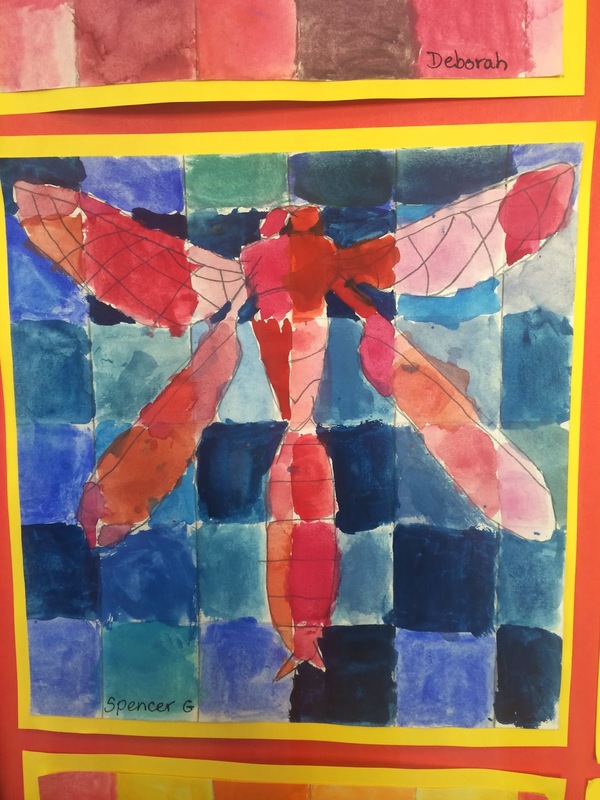 Here are some of the latest masterpieces from our Art Club. The children were experimenting with colour blending using water colours. 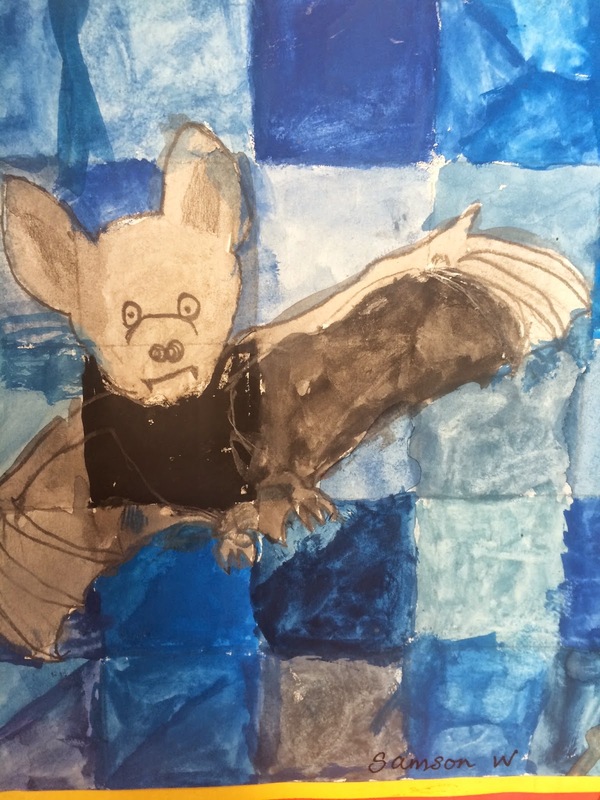 This was combined with a study of insects... and a bat! Well done on creating some stunning results. This was also a great way for our pupils to apply their learning skills. Reciprocity to work together to mix the paints and give each other feedback. 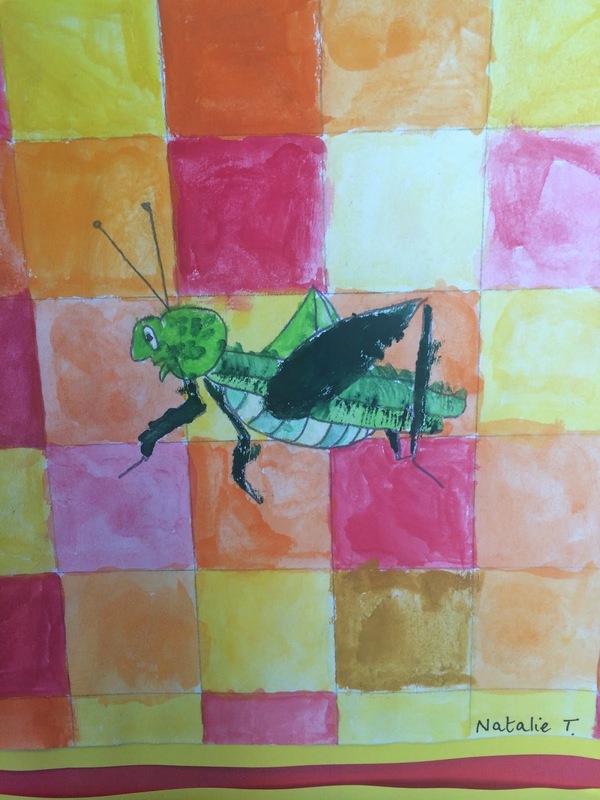 Resourcefulness to have the grid lines to help make the drawing easier and reflectiveness to notice how the paints could be mixed more effectively! The Parent Council asked if photos could be posted of new members of staff. We apologise for the delay, but we have finally captured the faces of our new teachers to share with you on the blog. Were you aware that Poland dethroned Brazil as monarchs of men’s volleyball at the weekend with an epic victory in four sets In fact, more than a half million fans – 563,263 – watched the matches during the 18-day event, smashing the previous records in the competition. Did you know that a crocodile can't stick out its tongue? This is because of a membrane which holds the tongue in place. Amazingly the first footprints on the Moon will be there for approximately a million years. There is no wind to blow them away! Thank you for your patience this morning while we waited for the fire alarm to be turned off. I appreciate that you all have places to go once you have dropped the children and you were all very understanding. It was a false alarm and the issue has now been addressed. 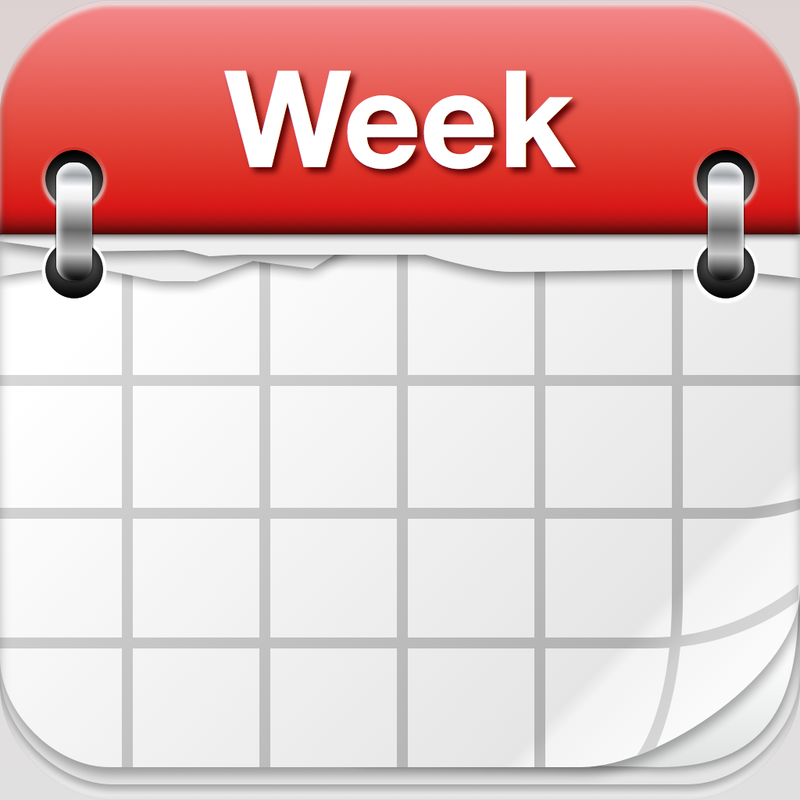 We would like to remind you that clubs will be starting from Monday. Please check your child’s book bag tonight for their club letter. Next week we have a Dragon Dance workshop for the Year 5 pupils studying China. Our Year 6 children are off to Queen Mary’s University for a Science workshop. On Thursday 2nd we have the SEN Coffee morning, hosted by Mrs Hoffman. We have the next cycling club for pupils on Friday afternoon. We look forward to welcoming parents and friends from Willow class to their Sharing assembly next week. A reminder that all children are expected to attend for every day of the school term. There will be another INSET day on Friday 24th October – when the school will be closed. Thank you to all the parents, carers, friends and relatives who were able to attend the McMillan Coffee morning this week. Our Year 6 pupils had prepared all the refreshments and were responsible for serving customers, caring for toddlers and dishing out the cakes! This year the children ran two competitions: Guess The Double Espresso & How Many Hundreds & Thousands. With donations, sales and the proceeds from the games, the children managed to raise over £300! Well done to the Year 6 team and thank you again for supporting this event. 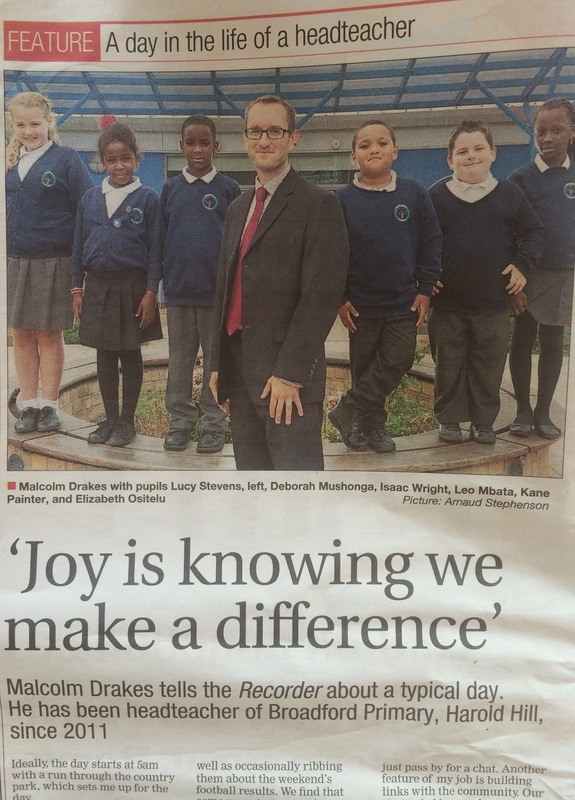 This week we have been featured twice in the Romford Recorder. 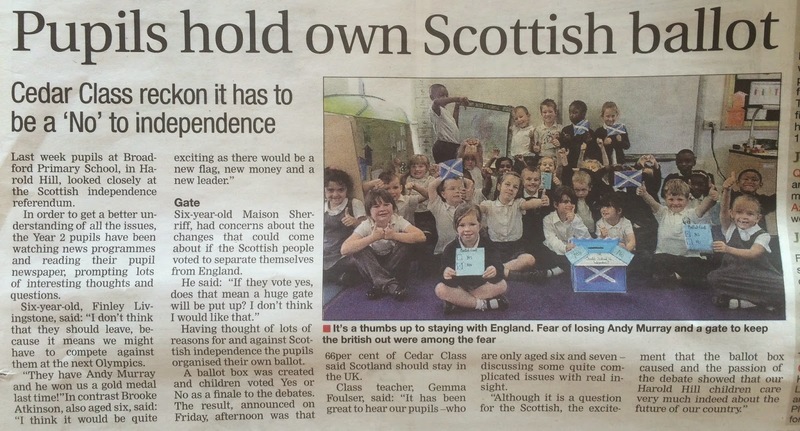 Our Year 2 pupils had their Scottish Independence referendum highlighted - it turns out that their prediction was fairly accurate. 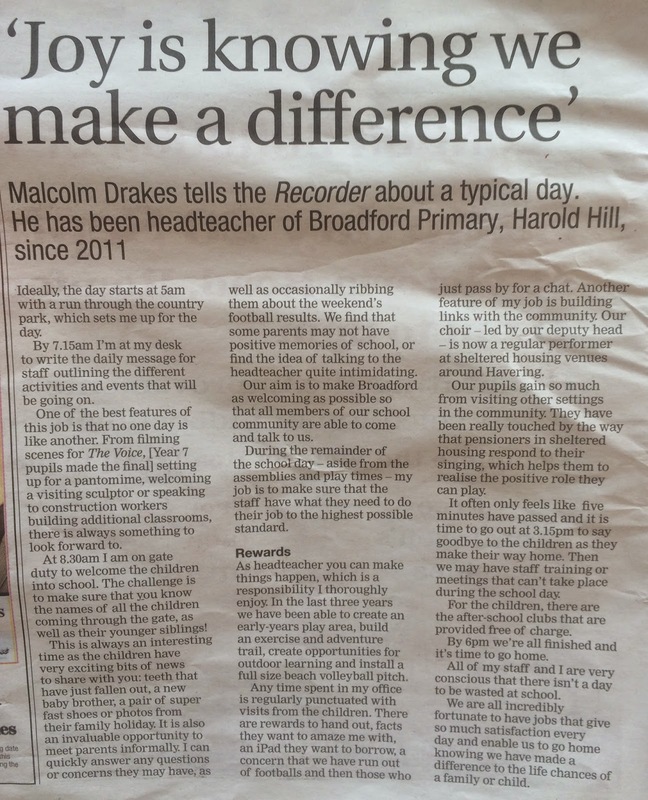 There was also a feature on Mr Drakes and what a typical day is like for a Headteacher. It is great to have the opportunity to share what we do with your children at Broadford with the wider community. 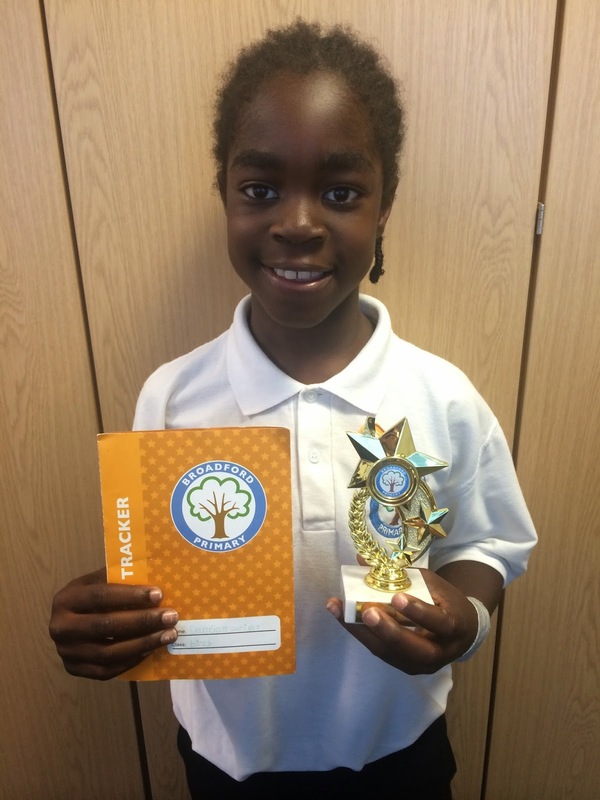 The coverage over the last three years has really helped to raise the profile of your children's achievements! 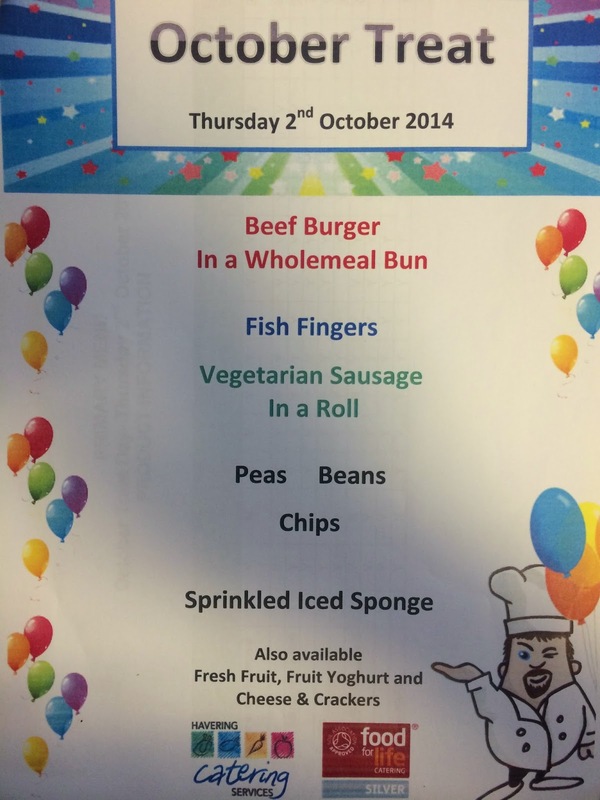 Mandy will be rustling up a special menu for the Census day to promote our school lunches. This year has seen a dramatic rise in the number of meals being served - 220 is the peak so far. If you are a Junior pupil Y3-6, then you can buy a ticket on Mondays and Wednesdays. For all of our Reception and KS1 pupils, schools dinners are now free for all... everyday! Tracker Cards: Emily Gets Gold! Get Caught Reading - Natalie in hospital!